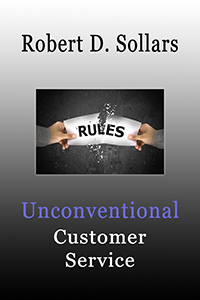 Welcome to Unconventional Customer Service: How To Break the Rules and Provide Unparalleled Service. This book was designed to assist you and your company in the pursuit of providing excellent customer service to those who count the most in your business. The basic precepts that I present here are as applicable to a salesman selling knickknacks as they are to a security officer walking a patrol in a dark warehouse at 3:00 a.m. Excellent customer service is what customers want above all. Over my decades of working in many capacities for many different types of companies, I have personally used all of these ideas, and they've all worked extremely well and achieved great client satisfaction. They may need some tweaking to fit your company, but they will work. I guarantee it. Knowing Robert for the past 30 years, I've seen his unconventional customer service grow in popularity. It simply works! I would not hesitate to recommend that you consider his expertise and his passion for assisting others with this issue. Links to purchase the book at other online stores will be added here as they become available. School violence can happen anywhere and at any time, in big schools and small ones, in big cities and small towns. The perpetrators can range from social misfits to seemingly nice, well−adjusted kids. But that doesn't mean that we're helpless to prevent, or at least minimize, school violence. 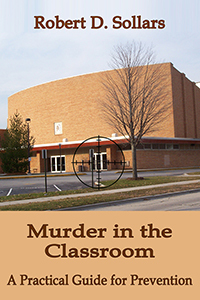 In this book, Robert D. Sollars, a security professional, describes the early signs of violence teachers and school administrators must look for. He discusses the need for changes to school buildings—from building layout to the type of door each classroom should have. He doesn't limit himself to what schools should do; he also talks about what parents must do at home. As he says in the Introduction, "These ideas will work for any size school or district. You have to tweak them for your own use, but they will work. I certainly believe that the lives of our children, the future of this country, are much more important than any ideological political arguments, left or right." Robert D. Sollars has more than three decades of experience in the security field. He has held various management positions at both national and regional security companies in St. Joseph and Kansas City, Missouri. He is also a prolific writer, having published more than 75 articles, and has appeared on radio and television. He has appeared in the media as an expert more than 150 times, including stints as a featured expert on two radio shows in Phoenix. Robert has worked in varied fields and positions in his career. While he has been in security for most of his career, he has also had stints in day labor companies (as a dispatcher and laborer), in restaurants, sales, janitorial services, call centers, and finally in human resources positions. Throughout his career, Robert has worked with all entities to ensure that they received the services they were working or paying for. He accomplished this with methods that have been variously described as innovative, quirky, creative, weird, stupid, and unworkable. But despite what naysayers have said, he has persisted and been successful during his career. He has worked out details and come to conclusions that were both satisfactory and beneficial to every entity he has worked for — companies, officers, and clients. From employees who threatened to quit in the middle of a shift, leaving no one to protect the client's property, to clients who wanted to cancel contracts because of misinterpretation of their orders, Robert has experience handling it all. He has been involved with school violence since learning of an incident south of his hometown in 1987, in Mid-Buchanan School District in Faucett, Missouri. He began studying, researching, and writing about workplace violence in 1991 and is considered an expert in both areas. After going blind in July 2003, just six weeks after moving to the Phoenix area, Robert continued in his quest to increase security awareness. Being blind has given him a special insight and perspective into security and the introspection to begin writing in earnest. As he says, "Being blind forces you to listen more intently than seeing with your eyes alone." Since that time, he has started a blog that is published twice weekly on his website, www.robertdsollars.com, as well as publishing two books on school and workplace violence prevention. Additionally, he has a book due in late 2018 on customer service. He has also published numerous other articles and appeared on many local and national shows as an expert. Robert has three children and has always been concerned with their safety at school. While the chance of violence was remote where they went to school, he knows that it can happen to anyone, anywhere, at any time, for any reason. Robert and his wife, Eileen, live in Phoenix, Arizona with a very dutiful guardian watch cat, Brigadier General Jasmine Squeakers Long Hair, Chief of Cat Fleet Operations and Security. Robert swears that his former furry friends watch out for him as well. They include his former cats, Admiral K'reme, Former Chief of Cat Fleet Operations; Commander BooBoo, Chief of Cat Fleet Medical; and Gunnery Sergeant Missy Beagle, Field Commander of Ground Forces. You can also sign up to receive mailings of blogs, media appearances (future and past), and other items.